Meine Kollegin Frau Dr. H übersendete mir die Fragebögen zu ausfüllen. Gerne teile ich mit Ihnen die Information mit. Zusätzlich zu den ausgefüllten Formularen sende ich auch einige Beispiele von meinen Ergebnissen. Ich hoffe, dass das hilft unsere Problemen zu lösen. Ich frohe mich auf Ihre Mitarbeit. Vielen Dank für Ihre Antwortund dafür, dass Sie sich die Zeit genommen haben, unseren Fragebogen auszufüllen. Es tut mir leid, dass Sie Probleme mit unseren Antikörpern hatten. Da Sie diesen Antikörper schon erfolgreich benutz haben, muss ich annehmen, dass Sie dieses Mal leider eine schlechtes Röhrchen bekommen haben. Deshalb wurde ich Ihnen gerne ein Ersatzröhrchen anbieten. https://www.abcam.com/index.html?datasheet=9385 (or use the following: https://www.abcam.com/index.html?datasheet=9385). 2.) Außerdem möchte Ich vorschlagen, ab63602 auf einem frischen Blot einzusetzen. Falls nicht viel nNOS vorhanden ist, kann es sein das nach dem Strippen nicht mehr genug Protein auf der Membran ist um detektiert zu werden. 3.) Bei schwachen oder fehlenden Signalen kann das Blockierungagens in der Antikörperlösung weggelassen werden. 4.) Laut dem EST Profile von NCBI unigene, ist nNOS nicht oder kaum im Herzen exprimiert. ich schlage deshalb vor eine Positivkontrolle zu verwenden. Gehirn und Skelettmuskel zeigen eine hohe Expression. Dear responsible, I want inquire if your beta-cardiac myosin heavy chain peptide (ab66470) is tested on western blotting? 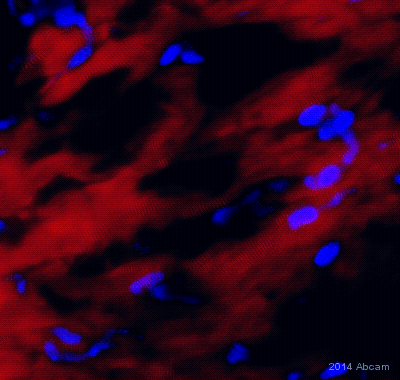 I want a mouse monoclonal antibody against MYH7 protein, and MYH7 control protein for my WB. 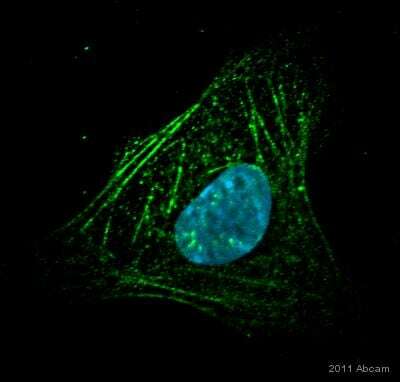 I did not find a monoclonal Ab in your company, but I found a competitor's product (mouse monoclonal antibody). 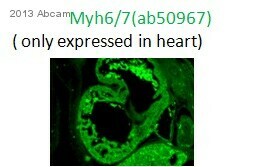 Can I use your beta-cardiac myosin heavy chain peptide (ab66470) as a control protein for the Ab. If you have any other suggestions please inform me. Thank you for contacting us. 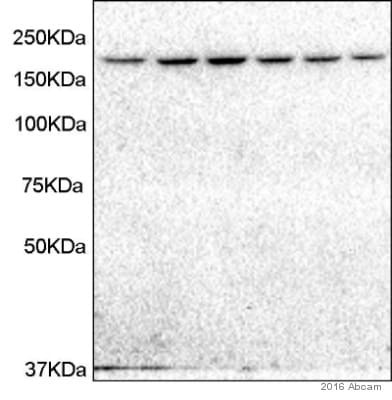 Unfortunately, I would not recommend using ab66470 as a positive control in Western blot: It is a synthetic peptide derived from within residues 600 - 700 of Human beta-cardiac myosin heavy chain. This peptide was used as an immunogen for an antibody and is only 20 amino acids in length. Therefore, it is hardly suitable for Western blot. I apologise for the misleading information on our datasheet. 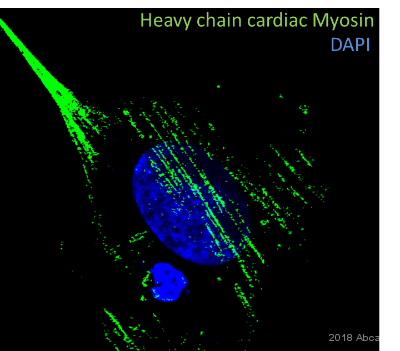 Indeed, we do have two anti-MYH7 (heavy chain cardiac Myosin) antibodies available in our catalog: ab15 and ab50967 which are guaranteed to react with myosins with the indicated affinities. All tested applications and species are specified on our datasheets, which are updated as soon as any new information is brought to our attention. Please find more detailed information here: Click here (or use the following: https://www.abcam.com/index.html?datasheet=15). Click here (or use the following: https://www.abcam.com/index.html?datasheet=50967). Although we do not have a suitable purified control protein available, I would suggest one of the following lysates. The above mentioned antibodies have been shown to give positive signals with these tissues. Furthermore, these lysates can be of use in future experiments as a positive control for other proteins than myosin as well. ab3869: Click here (or use the following: https://www.abcam.com/index.html?datasheet=3869). ab30291: Click here (or use the following: https://www.abcam.com/index.html?datasheet=30291). I am pleased to let you know that all our products are covered by our Abpromise: We are happy to offer technical support, and in the event that a product is not functioning in the applications cited on the product data sheet (and the problem has been reported within 6 months of purchase), we will be pleased to provide a credit note, free of charge replacement or refund. 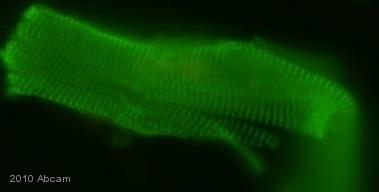 Furthermore, we do not currently have an image of ab15 in Western blot. Therefore, I can offer a discount off a future purchase if you buy ab15 now, use it Western blot and submit an image of your results to us in the form of an Abreview. The discount would be to the value of 1 free primary antibody. If you are interested in details of this offer, I would be pleased to send you more information on request. I hope this information is helpful to you. Please do not hesitate to contact me if you need any further advice or information in this regard.